That fossil fuels are bad for people and the planet is a cardinal tenet of both mainstream and radical environmentalism. Cato Institute scholar Indur Goklany offers a dramatically different assessment in Humanity Unbound: How Fossil Fuels Saved Humanity from Nature and Nature from Humanity. Global average life expectancy (the best single indicator of health) hardly changed through most of human history, averaging 20-25 years during 1 A.D. to 1750. Similarly, global per capita output (the best indicator of material welfare) was equivalent to an estimated $470 in 1 A.D., even lower — $400 — in 1000 A.D., and only $640 in 1750. Through most of human history, the vast majority of people were “mired in poverty.” Thomas Malthus’s gloomy prediction that economic growth would only lead to overpopulation, famine, and death seemed to bespeak the wisdom of the ages. 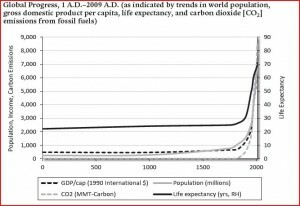 From 1750 to 2009, global life expectancy more than doubled, from 26 years to 69 years; global population increased 8-fold, from 760 million to 6.8 billion; and incomes increased 11-fold, from $640 to $7,300. Never before had the indicators of the success of the human species advanced as rapidly as in the past quarter millennium. Fossil fuels are the chief energy source of modern civilization. 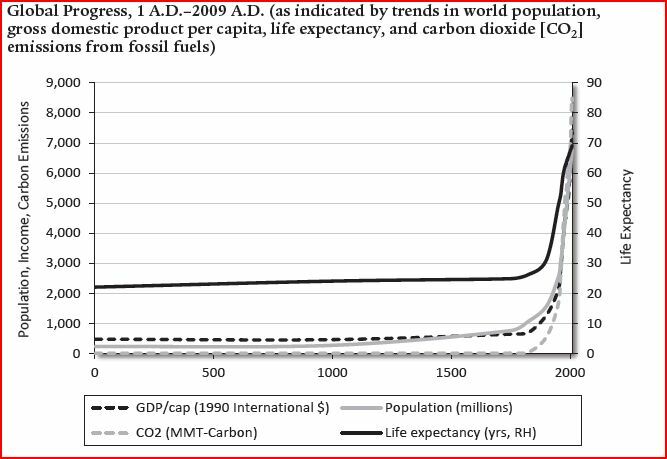 Accordingly, global carbon dioxide (CO2) emissions have increased rapidly along with life expectancy and per capita income. Goklany illustrates these trends with a graph that bears a striking resemblance to a hocky stick. Agricultural yields on the farm are driven by fertilizers, pesticides, water, and farm machinery. Each of these inputs depends to some extent on fossil fuels. Fossil fuels provide both the raw materials and the energy for the manufacture of fertilizers and pesticides; farm machinery is generally run on diesel or another fossil fuel; and irrigation, where it is employed, often requires large amounts of energy to operate pumps to move water. The Haber-Bosch process for manufacturing nitrogen fertilizer is responsible for feeding an estimated 48% of today’s global population, pesticides have reduced crop losses from pests by 26-40%, and average crop yields on irrigated lands are 3.6 times higher than on rain-fed lands. [I]n 2007, the global food and agricultural system delivered, on average, two and a half times as much food per acre of cropland as in 1961. New and improved technologies, coupled with greater penetration of existing technologies since 1961, account for 60 percent of total global food supplies. Fossil fuels also provide energy for refrigeration and raw material for plastic packaging — technologies critical to limiting food spoilage and waste. Finally, fossil fuels are essential for transporting food from farms to population centers and from surplus to deficit regions. The explosion in agricultural productivity is not only good for people, it is also good for species and wildlife habitat.
. . . to maintain the current level of food production [without fossil fuels], at least another 2.3 billion hectares of habitat would have had to be converted to cropland. This is equivalent to the total land area of the United States, Canada, and India combined. Considering the threats posed to ecosystems and biodiversity from the existing conversion of 1.5 billion hectares of habitat to cropland, the effect of increasing that to 3.8 billion hectares is inestimable. The above calculation underestimates the additional habitat that would have to be converted to cropland because it assumes that the additional 2 billion hectares of cropland would be as productive as the current 1.5 billion hectares—an unlikely proposition since the most productive areas are probably already under cultivation. Not only have these fossil fuel–dependent technologies ensured that humanity’s progress and well-being are no longer hostage to nature’s whims, but they saved nature herself from being devastated by the demands of a rapidly expanding and increasingly voracious human population. Fossil fuels are key contributors to a virtuous “cycle of progress,” Goklany argues. A better fed population is healthier and more productive. A larger population produces more ideas and better technology. Electrification extends the work day and powers computers, cell phones, and medical devices. Trade encourages the division of labor and the dissemination of ideas and technology. The author complains in his last paragraph about subsidies for renewable energy but completely omitts to say that the subsidies for the fossil fuel industry world wide and especially in the USA completely dwarf any public money spend on R&D of sustainable energies! The US tax payer subsidises the oil companies to the tune of billions of dollars annually. And the american public should tally up the phenomenal cost the military engagement in the Persian Gulf to protect oil interests there as tax subsidies of our status quo of our energy production as well. Next post: Will the Supreme Court Review EPA’s Greenhouse Gas Regulations?